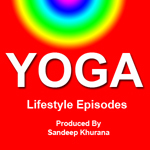 These are a series of episodes on "Yoga and Alternative Healing" narrated by Heather Shaw, and produced by Sandeep Khurana. Guided Meditations can be download from iTunes, please download the album, "Yoga Music & Guided Meditations" by Sandeep Khurana. Also available New Age Music for Yoga, Healing, Meditation, and Relaxation. More at http://skivamusic.com. The video episodes have aired on TV Channels in California.